We have deep specialization in the future of organizations, supported by our research into the future of work. Internal structure. Traditional hierarchical structures are being supplanted by far more flexible ways of bringing together roles and responsibilities. Work place and space. Work can be and is being done anywhere, transforming the role of the office, the nature of the workplace, and how and where employees work. Talent. What attracts the most talented is changing, requiring organizations to create a new compact with their staff and focus not just on personal value creation but also on meaning and contribution. External networks. Talent is increasingly accessed outside the organizations, shifting how business processes are run and the nature of organizational innovation. Value creation. Value will be primarily created in organizations’ interfaces with their customers, suppliers, partners, and community, changing priorities and business models. One of the most important issues is that organizations are becoming more unique. The paths to success are different for each company, and need to be explored individually to gain distinctive advantage. We work with a variety of sophisticated organizations to help them consider – and create – the successful organization of the future. This ranges from executive briefings through structured workshops, and often involvement in broader strategic initiatives shaping the future of the organization. 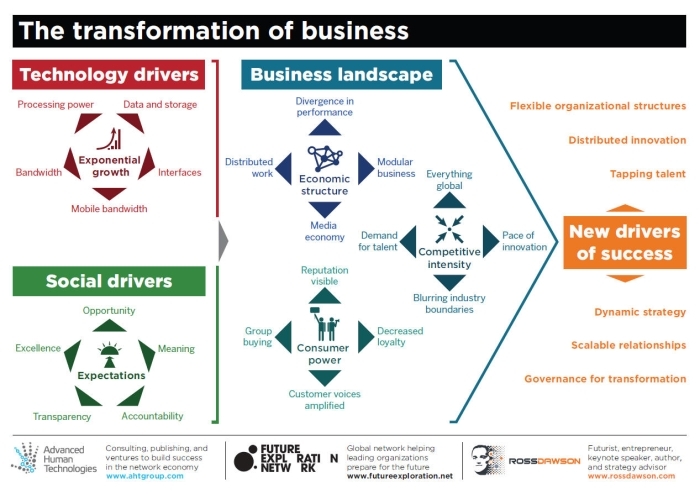 We collaborated with Advanced Human Technologies to create a framework examining the key drivers shaping business, the changing business landscape, and resulting new drivers of success for organizations. The new drivers of success indicated in this framework describe some of the characteristics of tomorrow’s successful organizations. As part of its work on the future of organizations, Future Exploration Network ran Enterprise 2.0 Executive Forums in 2008 and 2009. Speakers included global industry leaders such as Andrew McAfee, David Backley, Annalie Killian, Euan Semple, JP Rangaswami, and Peter Williams. Associated with the Enterprise 2.0 Executive Forums we ran an Enterprise 2.0 blog, including our own insights and those from attendees. Future Exploration Network ran the Top Web 2.0 Apps in Australia event in 2008. The list of the top 100 Web 2.0 Apps we created was featured in BRW magazine. Please get in touch if you’d like to discuss how we can help your organization to shape its future success.